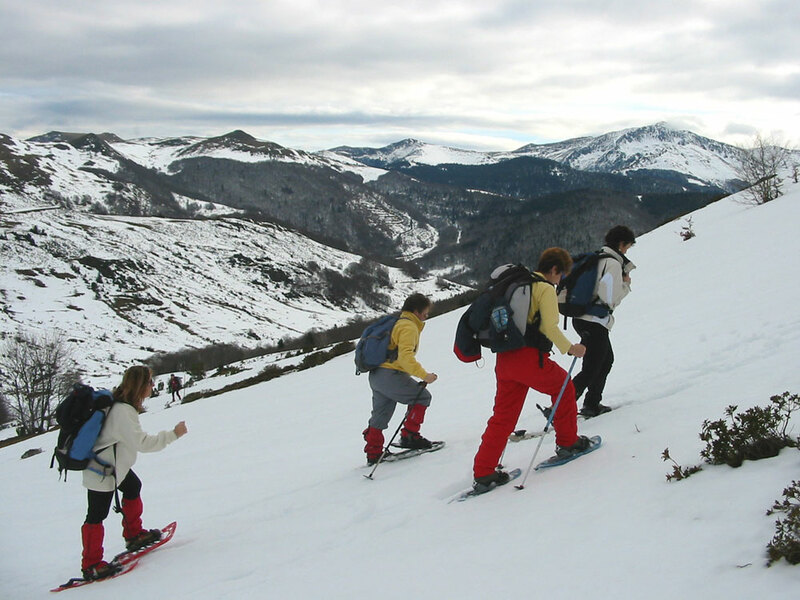 I thought I knew quite a lot about snow and glaciers in the Pyrenees: I have taken two snowshoeing courses (FFME and FFRP). 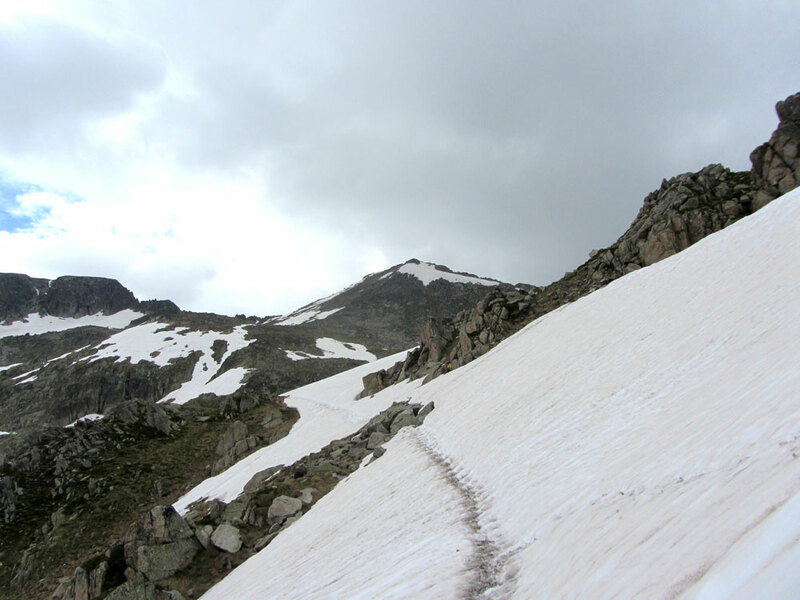 I have climbed Aneto (3404m) and many other Pyrenean mountains, some of which involve ice and crampons. Of course, crampons are not snowshoes, but the mountains are still there wagging their finger at you. 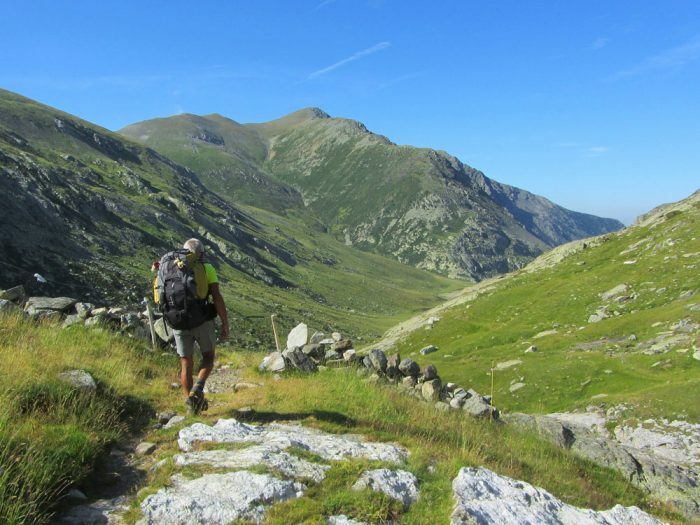 I know what it is like to traverse the Pyrenees from end to end, dipping my toes in the Atlantic at one end and slumping into the Mediterranean at the other. Three times. Including ten days mostly alone, with crampons on my feet. Add to that innumerable snowshoeing expeditions. But I still got it wrong. You can’t plan enough. I thought I was an expert, but this trek went seriously wrong: the mountains know how to cut you down to size. I had carefully studied the slope angles, so that wasn’t the problem. The unplanned factor was snow! Not being an Eskimo, I’d forgotten that snow comes in more varieties than I can name. In this case it was fresh, soft and deep. So soft that you couldn’t even make snowballs from it. So soft that, instead of gliding over its surface, our snowshoes sank into it. In places, the white stuff was nearly up to our knees. Even when the route was flat, every step was like climbing stairs with a tennis racket attached to our boots. I’d walked in these conditions before, but it was many years ago and I’d forgotten quite how difficult it is. We took turns to lead. 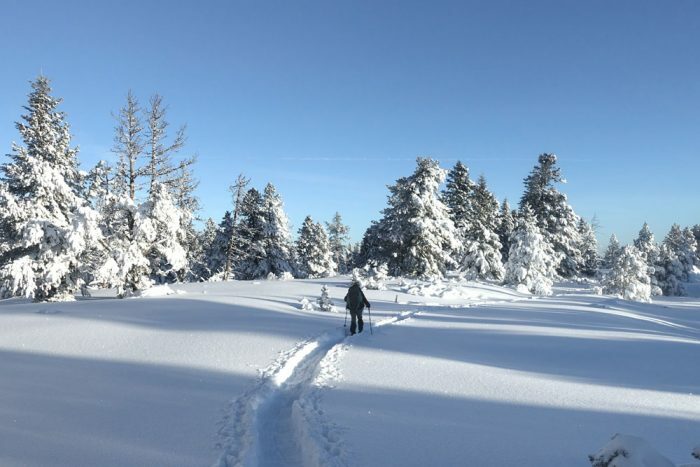 In these circumstances the first walker has the hardest job, forging through the snow. The second walker overlaps the first one’s footsteps taking care to compact some of the snow left untouched. The third and fourth complete the work, leaving the others with a clear channel to walk in. At first, leader’s turn lasted ten minutes. By the end we were counting the footsteps; nobody could manage more than fifty before falling back to the end of the line and letting the next person take over. I had been following the weather forecasts and had telephoned the town hall, so I knew that there would be fresh snow, but I hadn’t thought through the consequences. However, I had planned some things right: we were equipped with GPSs and headtorches and the weather was improving. New Year’s Eve 2000. If the weather had arrived on time everyone would have been happy. But the weather arrived early, and seven of the eight walkers never arrived at all. When they set out, the skies were blue. They were going to an area of rolling hills, the Coma de Vaca, just to the east of the Núria ski resort in Catalonia; nothing technical. At 14:15 one of the group telephoned her son to say that the day had been magnificent, and they were about to start coming down. They had reserved a table at a restaurant in Camprodón for 15:00. The photos found in their cameras afterwards showed the hills bathed in sun. But their bodies looked if they were swimming in the snow, frozen in movement. They had been hit by a torb, a combination of winds of over 150km/hour and a rapid 20°C drop in temperature. The wind picks up snow from one area and deposits it in another. A blizzard. But the most frightening thing is that they were experienced mountaineers – Aconcagua, 6962m, Mont Blanc, 4810m. They were well equipped. And they knew the area very well: it had been their ‘playground’ for many years. Yet all this wasn’t enough to keep them safe. Source. One person’s lack of skill can endanger the whole group. The incident happened about 15 years ago. She was the sister-in-law of a friend who had already signed up for a walk I was organising. “Can she come along too?” He asked. At one point on the walk, we had to traverse the side of a hill. Not up, not down; along the side. Nobody else had walked there since the snow had fallen. And now it was icy. The slope was about 25°, so we were walking on a slant. The technique is to walk like a duck, with one snowshoe pointing forward and the other pointing uphill. It is easy to trip up. For the rest of the group, it was a difficult experience, but our guest was petrified and soon exhausted. It was then I discovered that she had never done snowshoeing before and hadn’t eaten breakfast. We had to cut steps in the ice and it took us twice as long as expected to arrive at our destination. We were going to build igloos, but we didn’t have time, so we spent the night in a hut. It could have been much worse. It was my fault, not hers. It was my lack of experience that caused the problem. Since then, I always insist on testing out newcomers previously if the hike is at all challenging. So the wrong kind of snow, difficult weather and lack of experience can be problematic. But the biggest danger when snowshoeing is avalanches. This entry was posted on Tuesday, February 27th, 2018 at 4:21 pm	and is filed under Uncategorized. You can follow any responses to this entry through the RSS 2.0 feed. You can leave a comment below, or trackback from your own site.